We’re always very proud of our product development and these latest polyurethane engine mounts tick all the boxes. We always test our parts extensively before release, to ensure they meet our high standards. Using our knowledge and technology we strive to produce the best parts possible, taking the original parts and producing higher performance versions. This means we’re very proud to now be able to show you our latest products on general release. They are stronger – these parts will last longer than the original Rubber Nissan units. Polyurethane is a better quality material. They are an upgrade – they will give you more feel through the steering and will remove that ‘pendulum’ feel that’s caused when you change from decelerating to accelerating in the Fig. They cost less – the original Nissan mounts include the entire metal casing, our recycle that case and use only the insert. It’s this part which wears. A set of 3 mounts (no stabiliser bar) will set you back around £237.12 if you get them from Nissan. Our full set is £100 (£108.98 with UK P+P). (Price correct at Nissan 8/2/18). Our current range of polyurethane doesn’t end there however. 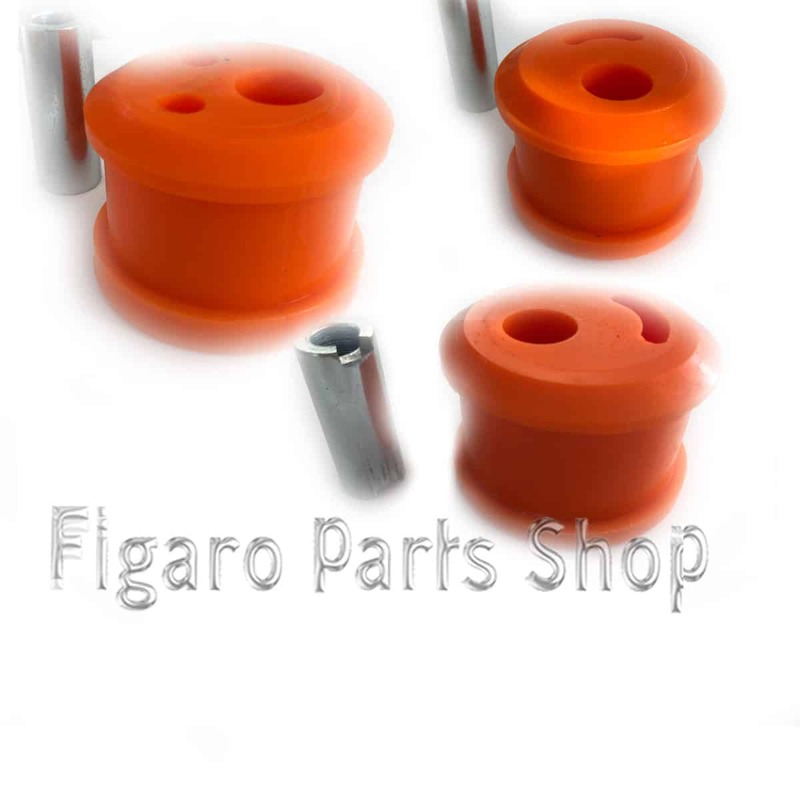 We also have these existing high performance Nissan Figaro parts available in our online store. Set of three polyurethane Nissan Figaro engine mounts. Left hand side gearbox polyurethane Nissan Figaro engine mount. Rear polyurethane Nissan Figaro engine mount. Right hand side gearbox polyurethane Nissan Figaro engine mount.